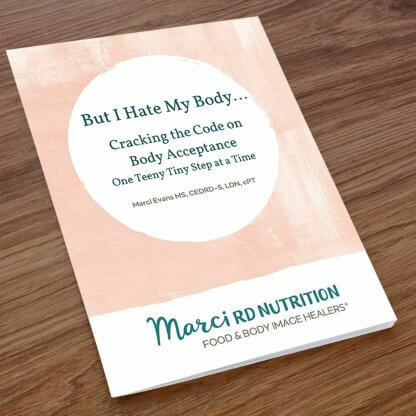 But I Hate My Body: Cracking the Code on Body Acceptance - Marci R.D. Are you thinking about the notion of body acceptance? Body acceptance is a super challenging idea for nearly everyone. We have been brainwashed daily, since birth, to feel deep shame about our size and appearance. So even considering the idea of body acceptance naturally feels wrong, terrifying, and deeply threatening. This response is quite normal. Acceptance begins with the Acknowledgement of Reality. And I want to help you get started on a journey to discover the world of body acceptance. I have created a guidebook with all sorts of resources for you to explore on your journey. It is a list of What to Watch, Read and Listen to on your Journey to Body Acceptance.